The red-brick Currituck Beach Lighthouse towers above the northern Outer Banks landscape in the Historic Corolla village. 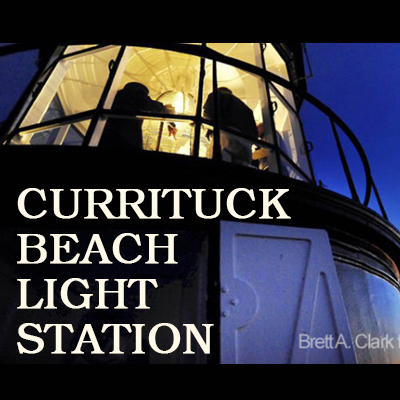 Visitors can climb the winding staircase, 214 steps in all, to the top of the lighthouse for a panoramic view of Currituck Sound, the Atlantic Ocean and the Currituck Outer Banks. Inside the lighthouse, at the base and on the first two landings, there are museum-quality lighthouse exhibits. On the way up or down, stop to learn about the history of coastal lighthouses, the Fresnel lens, shipwrecks and the lighthouse keepers. The 162-foot lighthouse was first lit on December 1, 1875. Onsite keepers, who lived in homes at the base of the lighthouse, operated the lighthouse until it was automated in 1937. With automation, the lighthouse no longer required a regular keeper. The lighthouse and its outbuildings fell into disrepair for decades until a nonprofit group called Outer Banks Conservationists (OBC) stepped in to save the lighthouse in the 1980s. OBC renovated the keepers’ buildings to re-create their past glories and restored the lighthouse tower to make it safe to climb. In 2003, The U.S. Department of the Interior awarded OBC ownership of the lighthouse. The light station grounds and parking are free. Climbing the lighthouse tower has an admission of $10 (cash or check, please), and children ages 7 and younger climb for free with an adult. There are no height restrictions in place. The lighthouse is open daily from before Easter through Thanksgiving (please note the site is closed for Thanksgiving Day). Climbing hours are 9 a.m. to 5 p.m. and until 8 p.m. on Wednesdays and Thursdays in the summer. During extreme weather, the lighthouse is closed to climbing. The smaller Keeper’s House, which was transformed into the Museum Shop, stocks everything lighthouse-related you could ever imagine. T-shirts, hats, books, postcards, blankets, taffy, ornaments, jewelry, magnets, figurines and more fill this former keeper’s residence. Admission to grounds and parking are free. To climb the lighthouse is $10 for adults. Children ages 7 and younger climb free with an adult.